Monotaxis trimaculata Hampson, 1900, Cat. Lepid. Phalaenae Br. Mus., 2:182. 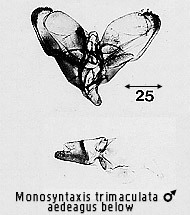 Monosyntaxis trimaculata Hampson; Holloway, 1976: 2. Diagnosis. The females of this and the next species are readily distinguished by the blackish hindwing border of the latter, though both have blue-black forewings broken by a row of three elliptical pale yellow patches. The males are entirely blue-black except for a dull reddish or orange patch at the base of the forewing. This patch is more conspicuous, dull orange in trimaculata, which is also larger overall, but dissection of the genitalia may be necessary in ambiguous cases. 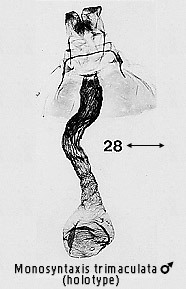 In trimaculata the saccular part of the valve is larger and more robust relative to the dorsal part. The saccus is much larger, and the aedeagus is broader. Habitat preference. The species is found predominantly in upper montane forest from 1600m to 2600m.